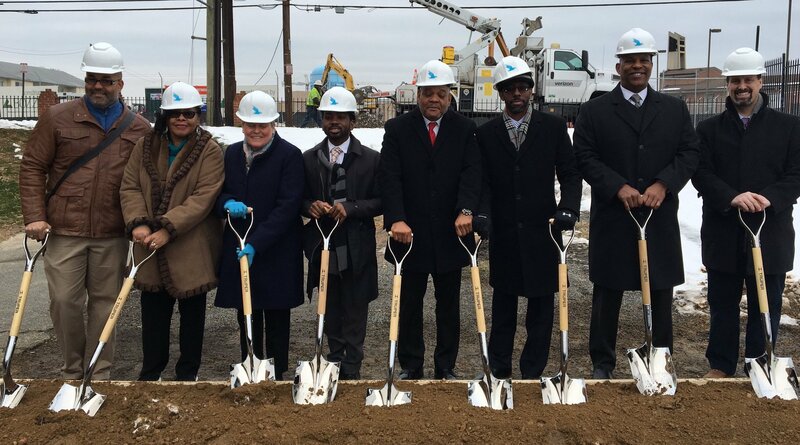 WASHINGTON, January 18, 2019 – Wearing hardhats and armed with shovels, city and community leaders celebrated the groundbreaking of Ainger Place Apartments, a new affordable housing community being constructed along Ainger Place, SE, in Washington, D.C.’s Ward 8. The event was hosted by Ainger Place Apartments’ developers: The Michaels Organization, Emmanuel Baptist Church, and Ainger Place Development Corporation. “We are very grateful to The Bowser Administration, the City Council, the local ANC, and everyone else in this community whose strong support for new, high quality affordable housing has enabled us to celebrate this milestone today” said Christopher Earley, Michaels’ Vice President of Development. Ainger Place Apartments will offer 72 spacious and environmentally conscious apartments in a mix of one-, two, and three-bedroom layouts. Centered around a courtyard of green space, the three-story elevator building will have on-site parking as well as a fitness area, a community club room and a business center. “Mayor Muriel Bowser and the developers of Ainger Place share a bold vision: working together to provide more safe and affordable housing for District residents. Thanks to a large commitment from the Housing Production Trust Fund, the vision is becoming a reality and sets a strong example of the partnerships needed to further expand affordable housing across the city,” said D.C. Department of Housing and Community Development Director Polly Donaldson. The community will be 100 percent affordable for families with incomes up to 50 percent of the Area’s Median Income (AMI) and will have eight apartments permanently set-aside for the formerly homeless. The community spaces will be the site of programming and supportive services from non-profit service providers, including the locally based organization Open Arms Housing. Additional services will be provided by Better Tomorrows, a non-profit organization that currently serves more than 100 affordable communities within Michaels’ portfolio, offering a range of services focused on educational success, health and wellbeing, financial literacy, and community empowerment. “The DC Housing Finance Agency commends The Michaels Organization and Emmanuel Baptist Church for its vision to bring new modern and yet affordable apartment homes to Ward 8’s Randle Heights neighborhood. Ainger Place Apartments was the first development financed by DCHFA in FY 2019. Financing homes affordable to the residents of the District is at the core of our mission and we look forward to continued collaboration with our counterparts throughout Mayor Bowser’s Administration and The Michaels Organization on this soon to be delivered community” said Todd A. Lee, Executive Director & CEO of the D.C. Housing Finance Agency. The $29.3 million housing development will be 100 percent affordable for families with incomes up to 50 percent of the Area’s Median Income (AMI) and will have eight apartments permanently set-aside for the formerly homeless. Financing includes $10.1 million raised through the sale of federal Low Income Housing Tax Credits, $13.75 million via tax exempt bonds, issued by the D.C. Housing Finance, Agency, a $5.95 million HUD FHA-insured loan from SunTrust Bank, and $10.69 million from the Washington, D.C.’s Housing Production Trust Fund. The D.C. Housing Authority will provide rent subsidies for 18 of the units, which include the 8 designated as permanent supportive housing, and 10 that are reserved for households earned 30 percent or less of AMI. Once complete, The Michaels Organization, the largest, privately owned owner of affordable housing in the country, will provide property management services to Ainger Place. Additional members of the development team include Bozzuto Construction, which is serving as the general contractor, and local architect McKissack & McKissack. Kitchen & Associates is the supervisory architect. The tax credits were syndicated by Riverside Capital. Construction is anticipated to take about 15 months. About the Michaels Organization: The Michaels Organization is a national leader in residential real estate offering full-service capabilities in development, property management, construction, and finance. Serving 145,000 residents in more than 400 communities nationwide, Michaels is committed to crafting housing solutions that jumpstart education, civic engagement and neighborhood prosperity and to creating Communities That Lift Lives.